At the heart of the Maison de l’Architecture, a renovated monastry and hospital opposite the Gare de l’Est, the passage of time is literally painted on the walls. A staircase snakes upwards, twisting round on itself, accompanied by a myriad of faces and stratched messages, overlooked by two monumental windows. Natural light blends into the burning glow of the artificial across these symbols, making them appear slightly menacing. The walls of this building have provided a surface on which many stories have been written, the forms splashed across them are modern day hieroglyphics. I’m here on a sunny Monday morning, exceptionally finding myself with an hour to fill, and I am alone. I'm not sure if I'm allowed to enter the building at this time but the gate was open and nobody stopped me. I’ve been here before, on Sunday afternoons when families come to take advantage of the tranquility of the courtyard café, but I’ve never seen the staircase before. I understand now the reason for what the Figaro called the ‘Gothico-Punk’ interiors of this wing of the building. When ancient buildings are renovated, there is a tendancy to strip them back, to sandblast the walls and to clean out the guts. The goal is to rediscover an unobtainable original state and to unearth the hidden colours of the primary materials, but the inevitable result is also to pull down the layers of history. When this interesting multi-functional space was primed for development at the beginning of the century, this dilemma was one that faced the teams of architects. The decision had been made to divide the old Villemin/Recollets buildings into three parts, one for artists residencies, one for visiting researchers and one for the Maison de l’Architecture. It is this third part which interests me, containing as it does the original chapel and the graphic traces of the past. Here are walls that have reverberated to the chants and footsteps of monks, up to 200 of which were based here in the 17th and 18th centuries. Here are walls that were requisitioned by the revolutionary forces in 1789, that became a barracks then a shelter for elderly and a hospice for men with incurable conditions. Here are walls that stood firm when the railway arrived and cut a chunk of the original structure away, the walls that saw generations of wounded soldiers pass through right up until 1968. 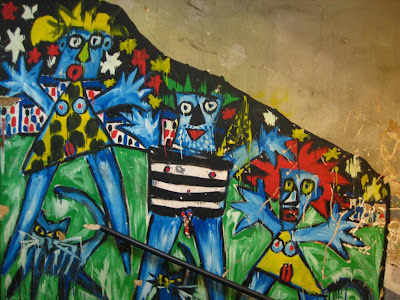 Finally, these are walls that became an artists’ squat, the shelter for the ‘Anges des Récollets’ and walls that became their canvases. The architects given responsibility for this part of the building were Karine Chartier and Thomas Corbasson, a young team who had presented the most interesting project. They had two principal objectives; to respect all the traces of history in the building and to recreate some of the original volumes. To them, it quickly became clear that the major witnesses of this passage of time were the walls that make up the structure, and that these should be left almost in the state they found them. This was a courageous decision when we take into account the fact that the squat was forced out after a fire nearly destroyed the building in 1999. The chapel is now a meeting room and performance space, and a café has been brought into a central area and allowed to spill out into an adjoining courtyard. These areas are rough, brought up to an acceptable safe level, but allowed to continue breathing out the past. It is the staircase though which best reflects this spirit. 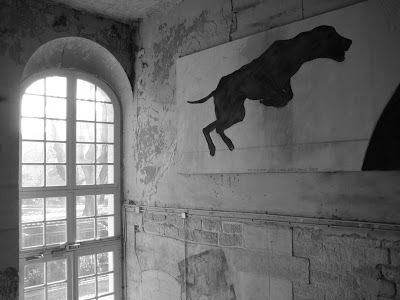 On either side a pair of black dogs leap away from the windows, perhaps towards the fire. Moving upwards, indiscriminate layers of creations, eyes without faces and phrases in meaningless fractions, upwards past peeling paint and cracked, cratered plastering, upwards to a fully preserved blue family with cats and a final locked door. Outside, it is equally as quiet. 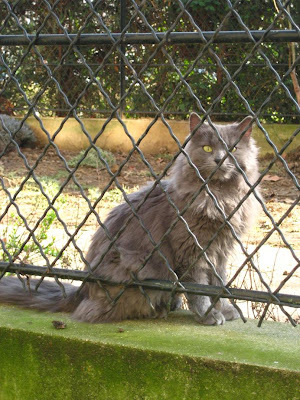 Crunching along the gravel path, the only eyes observing me are the piercing yellow ones of a fluffy grey cat. In the garden, a cast of metallic furniture, a reflection of the skeletons that have passed through this building over the centuries. I sit down and join them, silently enjoying the first warming sun-rays of spring. I do enjoy your writing and photos. How wonderfully written - again! This is a place I have said to myself so many times that I must visit! This made it even more imperative! Adam, sharing the walk with you through this very special place has been a wonderful moment. Thanks for that. 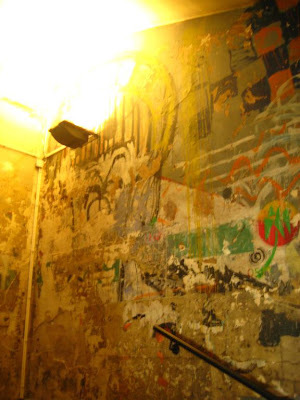 Seems like a less frenzied and more lyrical environment than Les Frigos...and cool that the creative markings on the walls had not been eradicated! I am going to make a list of some of these "invisible" places to visit when I am in Paris next! If one looks at the first picture a bit more closely, one will notice an unexpected adornment. At first, I thought it might just be coincidence, but after further examination, I'm certain it was intentional. It's always nice to find yourself alone in these places, and to just be free to wander around. Starman -> I think I know what you're talking about - I hadn't noticed! I apologise in advance to any children watching! Lovely, I would so like to see this.